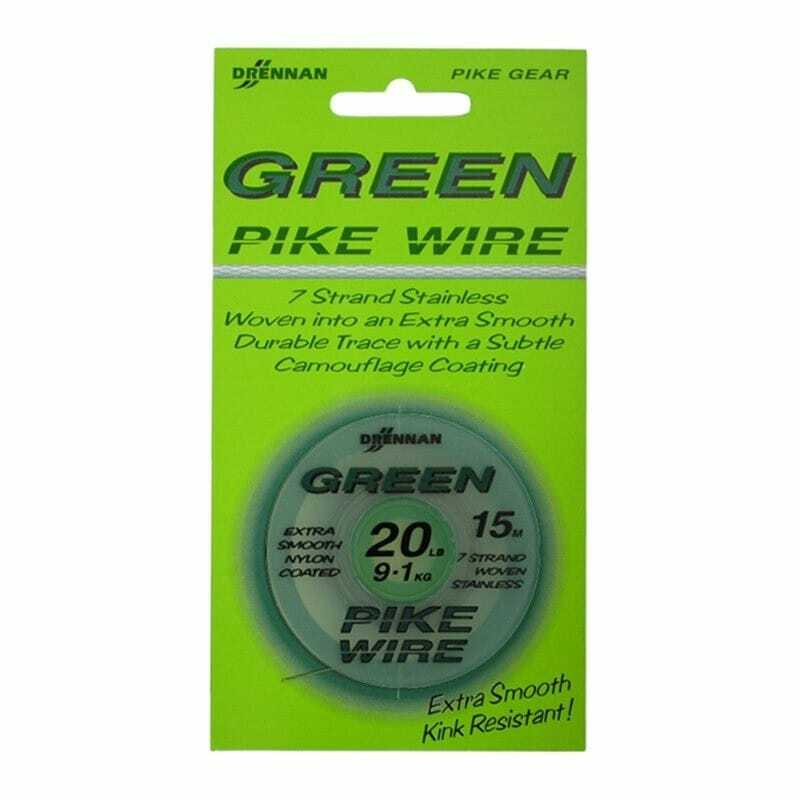 Drennan Green Pike Wire is a top quality stainless steel braid with an ultra thin nylon coating. This makes it extra smooth, kink resistant, improves durability and provides a subtle camouflage finish. Tips: The suggested crimp size for this wire up to 15lb is 0.75mm or 15lb – 28lb Slim Crimps. 20lb and 24lb Green Pike Wire is best suited to 0.90mm crimps or 28lb – 40lb Slim Crimps and the heaviest at 28lb is best suited to 1.10mm crimps or 40lb – 66lb Slim Crimps. Pike rigs can be made up by the traditional twisted wire method and the twist sealed in place by melting and fusing the nylon coating over a low flame. Alternatively Drennan Slim Crimps one size up from those recommended for Drennan 7 Strand can be used. For strongest joints flatten crimp in three central places, avoiding either end. When using a separate short section of wire on Rider hooks additional strength can be gained by heating the copper barrel after crimping. This will melt and fuse the nylon coating of the wire into a sealed unit.